The Inventory is where the player stores materials, objects and items that they have gathered. The inventory window has a limited number of slots, 200 in total, and once full, nothing more can be picked up. The Inventory screen is hotkeyed to "I" by default. The Inventory screen is also where the player equips armor and costumes. The armor slots outlined in light grey are the actual armor slots, while the eye icon denotes cosmetic slots. The player can equip any equippable armor in either the actual or cosmetic slots. The cosmetic slot item will always overtake the look of the actual armor slot, but none of the actual stats or bonuses apply. If one leaves the cosmetic slot empty, the appearance of the actual armor slot will be shown on the character. The player can equip three Techs, all variants of Sphere, Dash, and Jump. 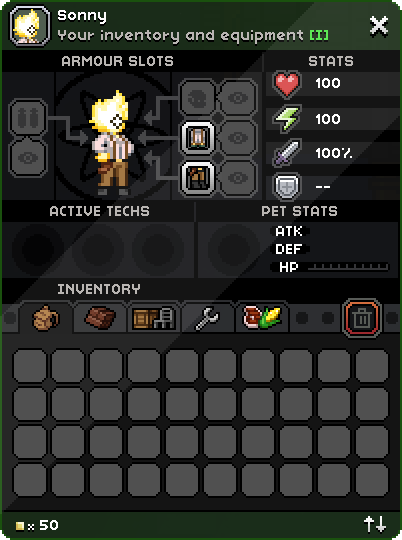 Techs can be equipped using the ship's Tech Station. There is also one Pet slot, which shows all pet stats. The stats listing to the right of the armor window shows the player's attack multiplier, maximum health, maximum energy, and defense. There are five inventory bags with a total of 200 inventory slots. Picked up items and objects will automatically sort into their appropriate bag. Selecting the Main Bag will open 40 inventory slots to store misc. objects, items, armor, and weapons. The Object Bag holds any picked up furniture. This includes lights, switches, doors, chairs, tables, beds and other decorative objects. Furniture will automatically be sorted into this bag. Like the other bags, it also has 40 inventory slots. The Reagent Bag holds crafting materials, which includes ores, salvage components required for building mech parts, and all other materials dropped from monsters or plants. Like the other bags, it also has 40 inventory slots. The Food Bag holds any crop seeds, food and food ingredients. Like the other bags, it has 40 slots. When new items and objects are picked up their respective inventory tabs are marked with a plus symbol. The items themselves will be indicated by a scanning animation over their icon in the inventory window. There is also a slot labeled Send to Trash. All items, materials and objects put into this slot will be completely deleted after a grace period of one second. Be mindful of what you put in here, as you will never regain it. Any item that is considered "critical" cannot be deleted in the Send to Trash slot. This includes the Matter Manipulator and it's upgraded functions (Paint Mode and Wire Mode). This page was last modified on 2 September 2017, at 17:55.